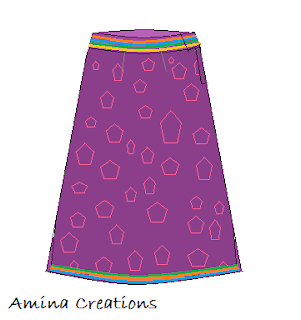 An A line skirt is a basic type of skirt which does not have flare or gathers. In this post I am sharing a tutorial on how to stitch an ankle length A- line skirt. Ankle length A- line skirts have slits at the sides or back to facilitate in walking. First decide on how long you want your skirt to be and measure the length. In the same way, measure and note down other body measurements. Use these body measurements and calculate all the measuremnts given in the construction and keep ready. Now take the cloth and fold it in the reverse such that two selve edges are on top of each other. Then fold again as shown. Mark the above measurements on the cloth. Cut leaving ½” allowance along the top, and 1” allowance along the sides and bottom. You will now have 2 pieces. Begin by stitching on the right side. And when you start stitching on the left side, stitch leaving an opening of about 4” or 5” at the top. Stitch a placket opening there. (A tutorial on how to stitch a placket opening will follow soon). Next stitch 4 notches, two in front and two at the back as shown in the figure. 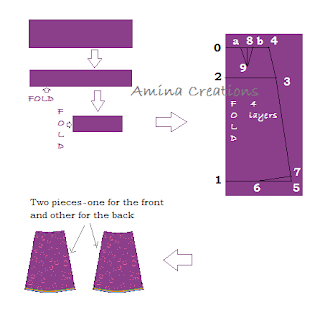 Now cut a strip for the waist band with the following measurements. width = 5" or 7"
Add button or hooks along the extra part so that it covers and closes the skirt. Now coming to the lower part of the skirt, you can have one or two openings along the lower sides to facilitate in walking. For this while stitching the sides leave 4” or 5” along the sides near the lower part and stitch the rest. The opening can be double folded and stitched (just like stitching the opening of a kameez). Finally double fold at the lower end and stitch. Your skirt is now complete. Hi... can u pls post a tutorial as to how to add lace borders to lehngas..esp the ones that brides wear with multiple borders n laces. As the lehnga follows a circular edge, sewing straight laces on to it becomes very difficult and the end product is not upto the mark!